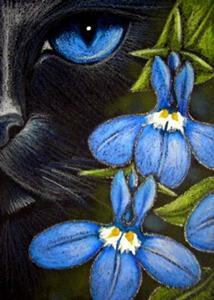 I just finished my last Black Cat Behind the LOBELIA FLOWERS, for the EBSQ SHOW. Added a delicate Glitter around the flowers and leaves. I really enjoyed drawing, and painting this beautiful flower.I hope you like it too. ;) I ALSO FOUND THE FOLLOWING INFORMATION REGARDING HER MEDICINAL USES: Native Americans used Lobelia to treat respiratory and muscle disorders, and as a purgative. Today it is used to treat asthma and food poisoning, and is often used as part of smoking cessation programs. It is a physical relaxant, and can serve as a nerve depressant, easing tension and panic. The species used most commonly in modern herbalism is Lobelia inflata (Indian Tobacco). As used in North America, Lobelia's medicinal properties include the following: emetic (induces vomiting), stimulant, antispasmodic, expectorant, diaphoretic, relaxant, nauseant, sedative, diuretic, and nervine. Because of its similarity to nicotine, the internal use of Lobelia may be dangerous to susceptible populations, including children, pregnant women, and individuals with cardiac disease. Excessive use will cause nausea and vomiting. It is not recommended for use by pregnant women and is best administered by a practitioner qualified in its use. Used Artagain/Strathmore 60lbs. paper with Prismacolor Premier Colored Pencils/Watercolor/Soft Pastels/Glitter.